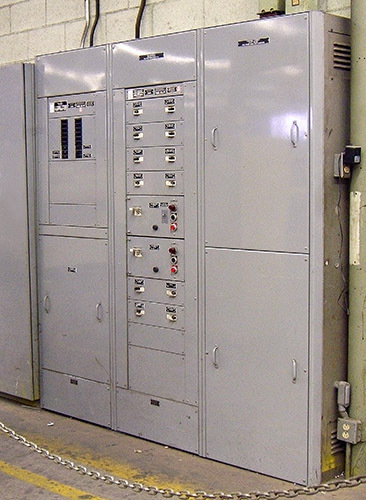 Our extensive experience has been culminated by the introduction of the free-standing distribution switchboard retrofit where the existing switchboard section is effectively gutted and the new interior, self-supporting with perfectly aligned front plates, is installed onto the existing enclosure. Precise engineering ensures that all conductors are of adequate length. Extends the working life and reliability of existing electrical distribution systems. Provides technological improvements in branch circuit protection. Maintains the integrity of the existing infrastructure. The underground and overhead conduit systems and conductors remain while the electrical distribution equipment and devices are upgraded. Each project is precisely engineered to ensure proper fit and function. This eliminates the necessity for costly field modifications and downtime. Switchboard retrofit of existing conditions is our specialty. We have the knowledge of existing construction techniques as well as the latest developments in electrical distribution components that enable us to successfully merge the new into the old systems. Engineering capabilities to enable the efficient upgrade to provide new overcurrent protection in existing enclosures. Free-standing framework that simply “walks” into place. Existing conductor lengths are always considered during the configuration process. Front-end engineering design support is available. Turn-key installation is available to ensure that full-spectrum quality is maintained throughout the project.